Software-defined networking (SDN) is reinventing the networking industry and enabling organizations to embrace the cloud computing era. With SDN, networking equipment becomes more programmable and enables automation that increases business velocity, while simultaneously delivering capital and operational savings. Vendors have differed in their approach to delivering on the promise of SDN. 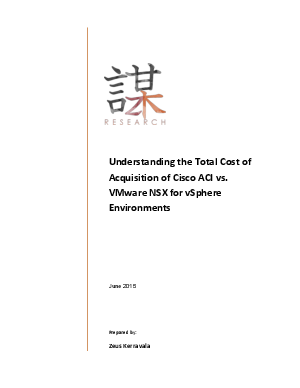 In this paper, we compare two such SDN platforms: Cisco’s Application-Centric Infrastructure (ACI) and VMware’s NSX platform. Cisco’s ACI is an integrated overlay model that addresses both physical and virtual networks as one network, in a consistent application-centric policy-driven framework. VMware’s NSX is a hypervisor overlay-based model that is VMware centric and requires network gateways to talk to bare-metal applications and other network endpoints. Cisco’s ACI provides a single pane of glass for managing all application components including physical and virtual networks, Layer 4-7 (L4-7) services, and, in the future, compute and storage. ACI correlates the health of the network to that of the application, and it provides deep visibility and troubleshooting capabilities.